Alton Takiyama Chung will be performing at this years Hearing Voices Storytelling Festival, April 11-18. He was recently interviewed on OPB radio in a segment that ran during Morning Edition. The OPB website has that interview (click on listen), as well as Chung performing the story of Fred Korematsu (click on the caption beneath Chung's picture). Korematsu was a Japanese-American citizen whose Civil Rights case stemming from the internment of the Japanese rose to the level of the US Supreme Court. 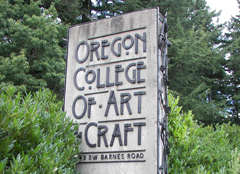 The Oregon College of Art and Craft (OCAC) library will be closed for Spring Break from Sunday March 22nd through Sunday, March 29th. Any requests for OCAC materials during this time may be significantly delayed. The Tigard Public Library wants to know how you feel about library services and customer service. Every year, they conduct a survey... and this years's is going on through Saturday, Feb. 14. Take a brief survey in the library or take it online from home. Three computers in the Tigard Library will be dedicated to the online survey. Both English and Spanish paper surveys will be available at the library, and they were also distributed through Cityscape, the City’s newsletter. Everyone is invited to participate, even those who have never used the library. Responses from the annual survey are used to provide new services or make existing services more patron-friendly. For example, the library has restored hours and added new ones according to patron responses over the last few years. Last year the Library received over 3,000 responses to the survey and made improvements based on the responses. 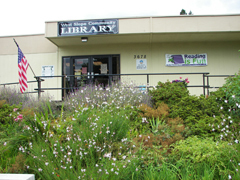 The Tigard Public Library is located at 13500 SW Hall Blvd. Learn more at http://www.tigard-or.gov/library/. West Slope Community Library will be closed March 31–April 1 for construction. You may still return materials in our book drop. Materials may be renewed by calling the renewal line (503-846-3245) or renew on the WCCLS website. Please pick up your holds before March 31st. Spring Break is just around the corner. With family budgets tight, many are looking for fun and affordable activities to both entertain and create wonderful vacation memories. Your local Washington County Cooperative Library Services (WCCLS) member libraries have just what you are looking for—over 50 free, entertaining and educational programs will be offered from March 20–29. Several libraries are offering daily movie matinees or marathons. The Hillsboro library is partnering with a local theater company, Bag & Baggage Productions, to offer a free teen acting workshop and screening of Shakespeare’s The Comedy of Errors. Family Game Days, Hands-on Crafts, Polar Bear Tales, Fancy Nancy activities and Teen Book, Movie and Music Swaps round out the calendar of fun opportunities. There is something for all ages from toddlers to teens. It is all local and the best part—it is all free. There is plenty to fill your week-long Spring Break vacation schedule. Check out the family fun at the library during Spring Break on this 5 page PDF! Learn to fold a paper crane to take home or display in Garden Home Community Library! Snacks and stories provided. The event takes place Saturday, March 21st at 1:00 PM. Garden Home Community Library is located at 7475 SW Oleson Road, just north of Garden Home Rd. There is a Japanese legend which promises good health, long life, and happiness to anyone who folds a thousand origami cranes. In Japan, cranes are said to live for a thousand years. Because a thousand paper cranes is an auspicious gift, it's traditional at weddings and to newborn babies. More recently, the thousand origami cranes has become a symbol of world peace. The story of Sadako Sasaki, a Japanese girl who contracted leukemia as a result of the atomic bombing of Hiroshima during World War II, tells her story in the book Sadako and the Thousand Paper Cranes. Beaverton City Library is offering two early literacy workshops for parents and caregivers of young children, ages 0-6. In this Early Literacy workshop you will learn about phonemic awareness and make some fun phonological games to take home. Brain Development - What's It All About? Friday, March 13, 2009, 11:00 a.m. - 12:15 p.m.
Tuesday, March 31, 2009, 7:00 p.m. - 8:15 p.m. In this Early Literacy workshop you will learn about brain-building activities and caregiver information to support early brain development. Registration is required for both workshops. Please phone (503) 350-3600 to register or sign-up in person at the Children’s Desk on the first floor of the library. These workshops are for adults only. Free childcare will be available upon request for those attending the workshop. These workshops take place in the Conference Room of the Beaverton City Library, 12375 SW Fifth St. If you'd like to take a short tour of some of the changes in the new version of WCCLS's library catalog, we have just the thing for you. In addition to our short (3 page) PDFs on What's New in the Online Catalog and the new permanent Title Lists, we have a video which hits all the high points. The overview video is divided into three sections: General Changes, Searching and Patron Account — so if you are only concerned with changes in your library account, you can skip right to that section. In fact, the video is set up so you can easily skip around. There is a new URL for the catalog: http://catalog.wccls.org/polaris/. So if you have bookmarks, please update them! Tualatin Public Library needs a design for our 2009 Teen Summer Reading theme! Create an original design, using the slogan “Express Yourself @ Your Library” for our 2009 Teen Summer Reading Event. The winning design will be used for all Tualatin Teen Summer Reading materials, such as posters, forms & flyers. The winner will be awarded a $50 gift card to the store of choice. The slogan Express Yourself @ Your Library MUST be a part of the design. Design must include artwork & slogan on 8.5 x 11 paper. Designs preferred in color. (Note: Please be sure that your media & colors are easily reproducible in both black & white and color on both paper and electronically. Computer-generated images may be used, but all components must be completely original. You may NOT use any copyrighted images. Limit 3 entries per contestant. Each entry must have a completed entry form (below) attached by paper clip. Contest open to all students, grades 6-12. All entries will become the property of the library and may be used for public display. The library reserves the right to make modifications to art & text. Entries will be judged by a panel of library staff and the Youth Advisory Council in early April. Questions? Email or call Aimee Meuchel at ameuchel@ci.tualatin.or.us or 503-691-3083. All entries must be received at the staff desk in the teen room by Tuesday, March 31st, 2009. The entry form is available on the Tualatin Public Library's website. Garden Home Community Library is pleased to present an Ikebana workshop on Saturday, March 14, at 1:00 PM. Ikebana, “life-filled flowers” is the Japanese art of flower arranging that focuses on the placement of flowers, branches and leaves in keeping with the Earth’s dynamic life energy. All plant material will be provided, though feel free to bring any flowers or branches from personal yards and gardens to incorporate into your designs. You will need to bring your own vase or dish for your take-home arrangements. Spots are still available for this class! Registration is required—contact the Garden Home Community Library at (503) 245-9932. Garden Home Community Library is pleased to present "On Paper Wings", March 3rd at 7 PM. On Paper Wings is a documentary film about the lives of the Japanese and American civilians who were affected by the balloon bomb project, and how they all came together forty years after the end of the war. In the spring of 1945, a Japanese balloon bomb claimed the lives of the only people killed on the continental U.S. as the result of enemy action during WWII. Forty years later, the decision to fold a thousand paper cranes would unite the Japanese and American civilians who were involved in and affected by this incident. The film has been screening, and garnering Best ofs, at many film festivals. The filmmaker Ilana Sol will be at Garden Home for the screening. The screening takes place at 7pm. Garden Home Community Library is located at 7475 SW Oleson Rd., just north of Garden Home Road. Yurtfolk is LuAnne Harley and Brian Kruschwitz. They live in Manchester, Indiana in a yurt! What’s a yurt? Find out from LuAnne & Brian. Hint: it ties in with their love of traveling and experiencing other cultures. Using instruments from A to U (from accordion to ukulele), they perform international songs and stories. Learn a foreign language as you sing! Tap your feet, clap your hands, play the spoons! Tualatin Public Library is located at 18878 SW Martinazzi Ave, just south of Boones Ferry. Hillsboro Main Library is located at 2850 NE Brookwood Parkway, just west of Dawson Creek.